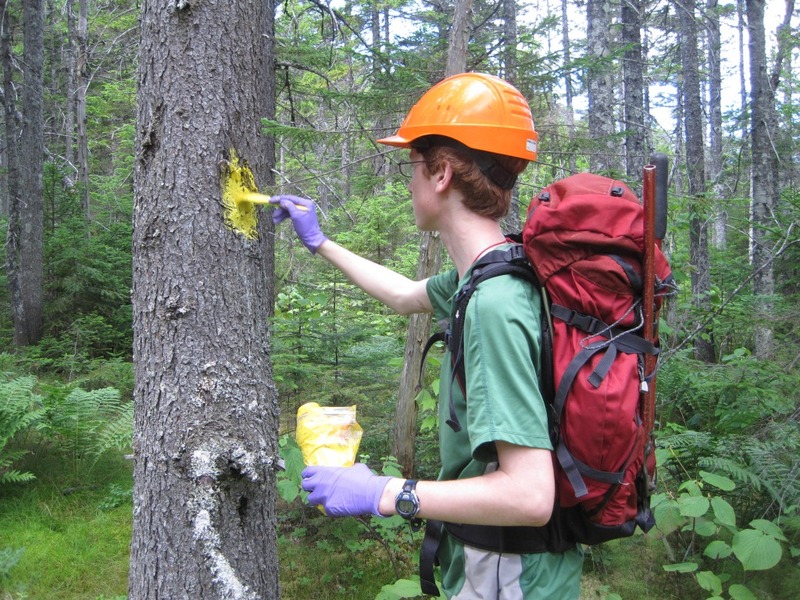 The summer is in full swing up in the North Maine woods, with the bugs mostly at bay and trail work progressing on several fronts. The second group of teen volunteers continued basic maintenance work on popular summer trails around the Maine wilderness lodges. Viewpoints on Indian Mountain near Little Lyford lodge are now unobstructed after the teens took their saws to downed trees and giant rootballs, and the corridor and drainages along the magical, mossy Henderson Brook Trail are now in the clear! 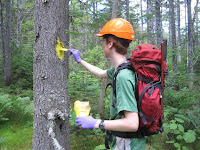 The group also broke out maps and compasses to travel off-trail along the Appalachian Trail corridor boundary. 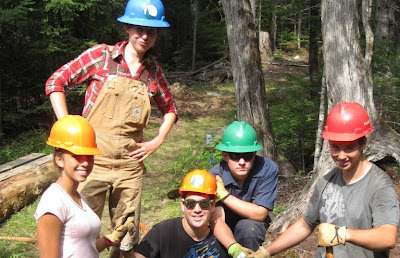 They cut brush, repainted blazes and located survey monuments to clearly define the edge of the AT's buffer zone, spurring conversations about wilderness ethics, our impact on the land as trail workers and how we value nature. 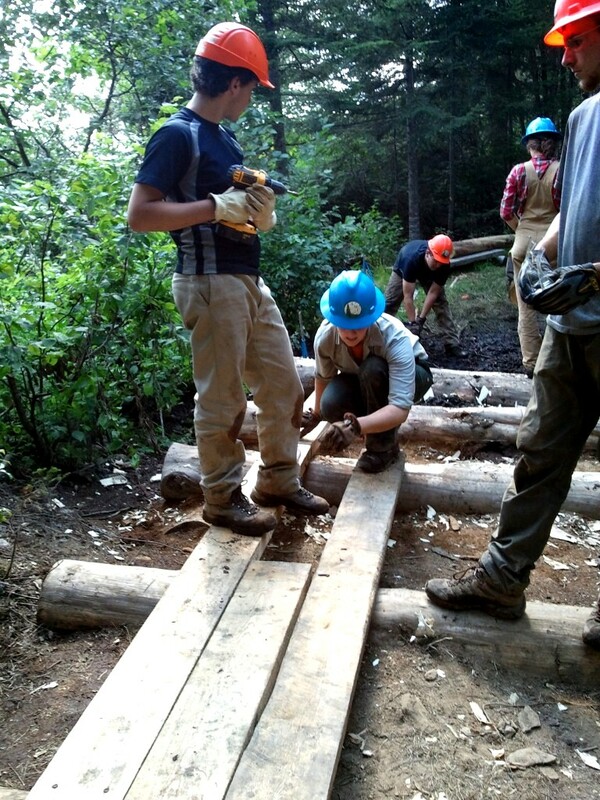 To finish out the work week, the group continued a ski bridge project initiated earlier in the season. 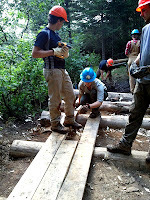 Everyone got wet, dirty and stronger from hard work digging up rocks from the muck, hauling dirt and setting 10-foot cedar baselogs. Each day finished with a refreshing dip in Long Pond, experimenting with campfire-building techniques and hanging out watching the sunset on the dock. 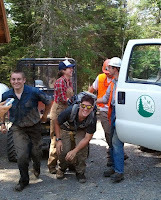 Particularly “boss” was the hike through Gulf Hagas, the Grand Canyon of Maine, on the last full day. Following along the rocky cliffs above the Pleasant River, the hike culminated with a swim below a breathtaking (literally: the water was cold!) waterfall. Thanks to the whole group for rising to new challenges each day, sparking dynamic conversations about politics and culture and being so positive!